Vatican City, 21 October 2012 (VIS) - This morning in St. Peter's Square, some eighty thousand people participated in a papal Mass for the canonisation of seven new saints: Jacques Berthieu, French martyr and priest of the Society of Jesus (1838-1896); Pedro Calungsod, Filipino lay catechist and martyr (1654-1672); Giovanni Battista Piamarta, Italian priest and founder of the Congregation of the Holy Family of Nazareth and of the Congregation of the Humble Sister Servants of the Lord (1841-1913); Maria del Carmen (born Maria Salles y Barangueras), Spanish foundress of the Conceptionist Missionary Sisters of Teaching (1848-1911); Marianne Cope, nee Barbara, German-American religious of the Sisters of the Third Order of St. Francis in Syracuse U.S.A. (1838-1918); Kateri Tekakwitha, American laywoman (1656-1680), and Anna Schaeffer, German laywoman (1882-1925). In his homily, the Holy Father drew attention to the "happy coincidence" between the current assembly of the Synod of Bishops on new evangelisation World Mission Sunday which falls today, and the readings during today's Mass which, he said, show us "how to be evangelisers, called to bear witness and to proclaim the Christian message, configuring ourselves to Christ and following His same way of life. 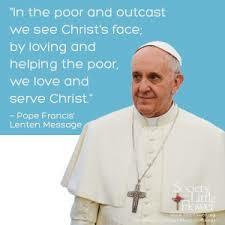 This is true both for the mission 'ad Gentes' and for the new evangelisation in places with ancient Christian roots. "The Son of Man came to serve, and to give His life as a ransom for many", the Pope added. "These words were the existential blueprint of the seven blessed men and women that the Church solemnly enrols this morning in the glorious ranks of the saints. ... They are sons and daughters of the Church who chose a life of service following the Lord. Holiness always rises up in the Church from the well-spring of the mystery of redemption. 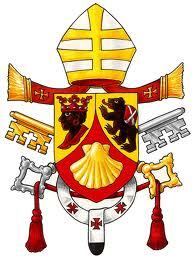 ... Today’s canonisation is an eloquent confirmation of this mysterious salvific truth". The Holy Father then turned his attention to the life and example of each of the new saints, beginning with Jacques Berthieu. 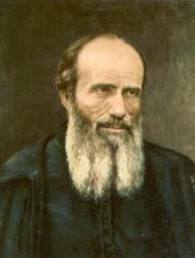 Born in France in 1838, he was "a tireless pastor on the island of Sainte Marie, then in Madagascar, he struggled against injustice while bringing succour to the poor and sick. ... He made himself all things to all men, drawing from prayer and his love of the sacred heart of Jesus the human and priestly force to face martyrdom in 1896. ... May the life of this evangeliser be an encouragement and a model for priests that, like him, they will be men of God! May his example aid the many Christians of today persecuted for their faith! In this Year of Faith, may his intercession bring forth many fruits for Madagascar and Africa". 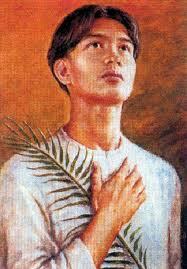 Pedro Calungsod was born around 1654 in the Visayas region of the Philippines. 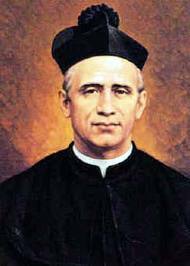 In 1668, he and other young catechists accompanied Father Diego Luis de San Vitores to the Marianas Islands to evangelise the Chamorro people. "Life there was hard and the missionaries also faced persecution arising from envy and slander", the Pope explained. "Pedro, however, displayed deep faith and charity and continued to catechise his many converts, giving witness to Christ by a life of purity and dedication to the Gospel. Uppermost was his desire to win souls for Christ, and this made him resolute in accepting martyrdom. ... May the example and courageous witness of Pedro Calungsod inspire the dear people of the Philippines to announce the Kingdom bravely and to win souls for God". The Italian priest Giovanni Battista Piamarta "was a great apostle of charity and of young people. He raised awareness of the need for a cultural and social presence of Catholicism in the modern world. ... Animated by unshakable faith in divine providence and by a profound spirit of sacrifice, ... when he was overburdened with work, he increased the length of his encounter, heart to heart, with the Lord, ... to gain spiritual fortitude and so return to gaining people’s hearts". 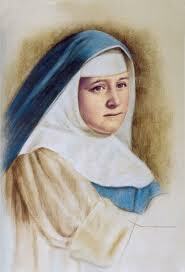 The educational work of the Spanish religious Maria del Carmen Salles y Barangueras, which she "entrusted to the Immaculate Virgin Mary, continues to bear abundant fruit among young people through the generous dedication of her daughters who, like her, entrust themselves to God for Whom all is possible", the Holy Father said. Marianne Cope "willingly embraced a call to care for the lepers of Hawaii after many others had refused". Later, on the island of Molokai, she nursed Father Damien and, following his death, continued his work among those stricken with leprosy. "At a time when little could be done for those suffering from this terrible disease, Marianne Cope showed the highest love, courage and enthusiasm". 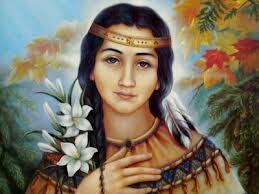 "Kateri Tekakwitha was born in today’s New York state in 1656 to a Mohawk father and a Christian Algonquin mother. ... She was baptised at twenty years of age and, to escape persecution, took refuge in the St. Francis Xavier Mission near Montreal. There she worked, faithful to the traditions of her people although renouncing their religious convictions, until her death at the age of twenty-four. ... Kateri impresses us by the action of grace in her life in spite of the absence of external help and by the courage of her vocation, so unusual in her culture. In her, faith and culture enrich each other. 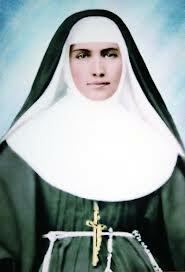 May her example help us to live where we are, loving Jesus without denying who we are. St. Kateri, Protectress of Canada and the first native American saint, we entrust to you the renewal of the faith in the first nations and in all of North America. May God bless the first nations". The young German Anna Schaeffer from Mindelstetten suffered a serious accident which left her with incurable burns on her legs and forced her to be bed-ridden for the rest of her life. 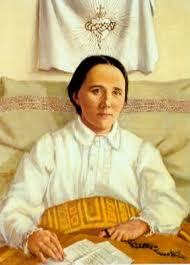 "Her sickbed became her cloister cell and her suffering a missionary service", said Benedict XVI. "May her intercession strengthen the Christian hospice movement in its beneficial activity". "These new saints, different in origin, language, nationality and social condition, are united among themselves and with the whole People of God in the mystery of salvation of Christ the Redeemer. ... May the witness of ... their lives generously spent for love of Christ, speak today to the whole Church, and may their intercession strengthen and sustain her in her mission to proclaim the Gospel to the whole world", the Holy Father concluded. Before praying the Angelus, the Pope invoked Mary Queen of all saints, recalling how the French Marian shrine of Lourdes is currently suffering the consequences of the flooding of the Gave River. He went on: "Today too we entrust to the protection of the Virgin Mary missionary men and women - priests, religious and lay people - who spread the good seed of the Gospel all over the world. We pray also for the Synod of Bishops which is meeting during these weeks to examine the challenge of the new evangelisation for the transmission of the Christian faith".